If you find substituting eggs in baking challenging, try making omelettes without eggs! Flaxseed, mashed banana, and applesauce could work well for delectable fudgy brownies. But what about the times when you crave for some good old scrambled egg, or a warm slice of quiche? Sometimes chickpea flour or tofu stir-fry just doesn’t cut it. That is when VeganEgg comes in to satisfy all your insatiable egg cravings! 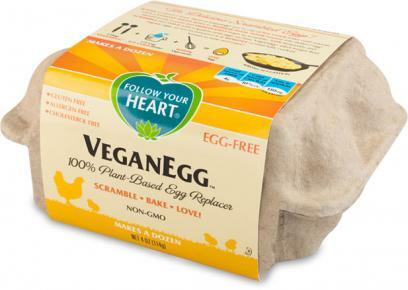 VeganEgg by Follow Your Heart is an egg replacer that gives you taste, fragrance and texture that resembles real eggs. Humorously packaged in an egg carton, it actually comes in powder form. To “create” one egg, simply mix two level tablespoons of VeganEgg with 236 millilitres of cold water, and whisk vigorously until smooth. Tip: use ice cold water and mix with a blender for even lighter and fluffier eggs! If being vegan isn’t enough, you may be delighted to know that VeganEgg is also gluten-free, dairy-free, soy-free, and non-genetically modified. Not only is VeganEgg suitable for vegans, since it is cholesterol-free, it is also a good alternative for omnivores who are cautious with egg consumption for health reasons. The main ingredients, whole algal flour and whole algal protein, are essentially starch and protein extracted from algae. 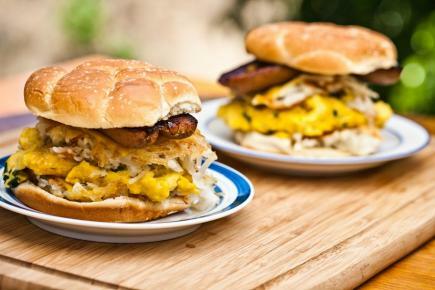 They create the signature fluffy and eggy texture that tofu or other egg replacers just cannot resemble. Nutritional yeast offers a yellow colour and a hint of cheesy, umami flavour. And Indian black salt, also known as kala namak, enhances the sulphurous egg-like scent that you may sometimes notice in hard boiled eggs. Don’t be alarmed: even if the sulphuric scent is strong while mixing, it is barely noticeable once cooked. Tending to texture, flavour, and even scent, VeganEgg stands as a promising egg substitute in any recipe, both in baking and cooking. Intrigued but don’t know where to start? Give it a go with this simple scrambled egg recipe, or indulge in a comforting vegan breakfast sandwich!